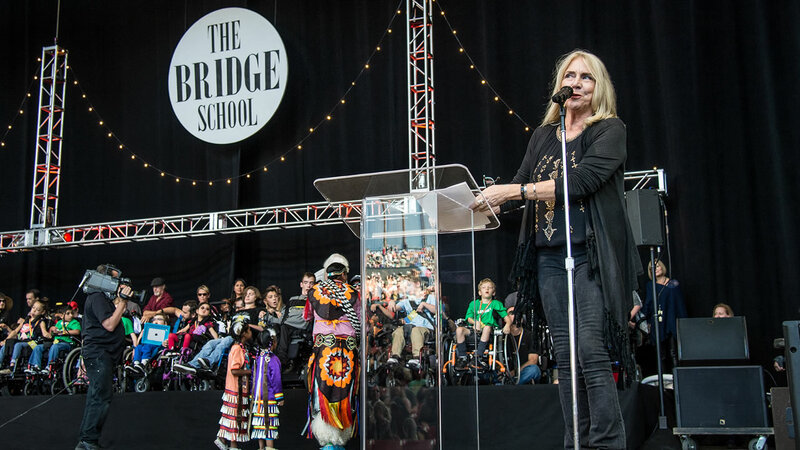 NEW YORK -- Pegi Young, who with fellow musician and then-husband Neil Young helped found the Bridge School for children with speech and physical impairments, has died. Young died of cancer Tuesday in California, according to spokeswoman Michelle Gutenstein-Hinz. She was 66. Additional details about her death were not immediately available. Pegi Young first conceived of the California-based school in 1986 after she and her husband struggled to educate their son Ben, born with cerebral palsy. Over the next three decades, the Youngs helped stage all-star concert benefits, with guest performers including Bruce Springsteen, David Bowie and Tom Petty. "I look at it with a great deal of satisfaction," Pegi Young told speakersincode.com in 2016. "It's kind of amazing that the school has not only sustained itself for all these years by way of the concert, of course, but how it's grown and evolved. "We started with the four parent-placed kids, very humbled beginnings, and it has just grown to have a global impact. Obviously, looking at the need for the endowment, to keep the school going, that's been the big focus for us, and it has been for some time." The Youngs, who also had a daughter, Amber, had been one of rock's most enduring couples. They met in 1974, when Pegi was living in a teepee, and married four years later. Neil Young's 1992 country-rock ballad, "Harvest Moon," is a tribute to Pegi. "Because I'm still in love with you," he sings. "I want to see you dance again. Because I'm still in love with you/On this harvest moon." But the Youngs divorced in 2014, a breakup Pegi Young addressed candidly in her 2016 album "Raw" and which also led to a rift between Neil Young and former bandmate David Crosby. After Young began dating actress Daryl Hannah, Crosby called her a "purely poisonous predator." Crosby later apologized, but Young, who married Hannah last year, was enraged and has not played with Crosby since. Pegi Young made several previous albums, including "Bracing for Impact" and "Foul Deeds." On her self-titled debut, which came out in 2007, Neil Young played guitar, harmonica and sitar. "Neil was always encouraging me to do it," she told The Associated Press in 2007. "But I didn't want to lean on him and he didn't want me to have to lean on him."